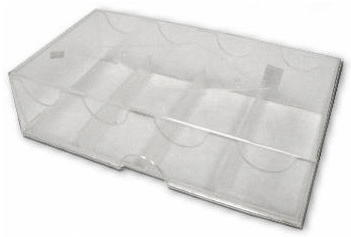 This Clear Acrylic Poker Chip Box is great for storing or organizing 100 poker chips. Each chip box cover extends to the bottom of the chip holder. These boxes make for easy handling of chips. Our poker chip boxes will stack one on top of the other for great storage. This box measures 6.5 in. (long) x 3.5 in. (wide) x 1.5 in. (deep).